Day two of birthday/ thank you week! My go to nail colors for fall....Power Clutch when I want something more edgy and Ballet Slippers when you just want to be classic. The Good to Go top coat will change your life...it cuts drying time drastically...I recently switched to it from Essie's chip skip and I'm so glad I did! Leave a comment below: Do you keep your toes done in the winter/ fall or not worry since they are covered.. most of the time?! 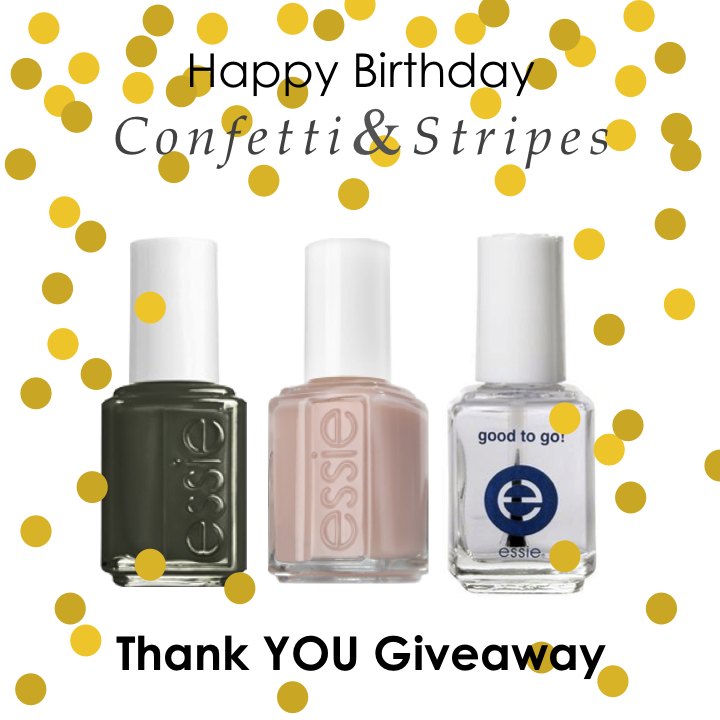 For one additional entry follow Confetti & Stripes on Pinterest and leave a comment letting me know...must be a separate comment to have your name entered twice! One winner will win: one Essie Power Clutch, one Essie Ballet Slippers, and one Essie Good to Go and be announced next Wednesday, October 23 via my instagram. Don't forget to enter the day one giveaway here. I still keep my toes done in the winter, but not nearly as "nice" as in the summer ;) I've never seen Power Clutch before, what a great color! I follow Confetti & Stripes on Pinterest now! I try in winter but don't stress about it as much! I follow confetti and stripes on pinterest! Love Essie! I do keep my toes painted in the winter because I take a barre class and go barefoot for that. Can't stand to look at my unpolished toes. I always keep my toes painted in the winter. Just because they are covered up doesn't mean they still can't be pretty! I keep my toes done more than my nails. Don't you feel like (being a decorator) we are sometimes really hard on our nails?! Maybe that's just me! I love Essie! My toes are literally always painted or I feel awkward! I get my toes done some but not as often during the fall and winter--your color choices are some of my favorites as well! Oh and I'm following on pinterest--can't believe i had not already thought of that! I try to keep them looking decent, definitely not as committed to them as I am in the summer months! Love these colors! Essie is such great polish. i always do my nails and toes at the same time and since i do my nails a couple times a month i usually always do my toes too! i also follow your pinterest! I keep my toes up all year. Just makes me happy! If I had some colors I love I'd keep my toes done in the winter! I try to keep my toes done in winter, but definitely slack off a bit! I always keep my toes painted during the fall/winter!